The exhibition was held in the Rare Books Exhibition space, Sir Louis Matheson Library, Monash University from 31 March - 30 June 2006 Opening address given by Philip Goad, Deputy Dean and Head of Architecture, Faculty of Architecture Building and Planning. 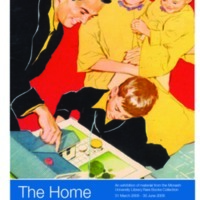 This exhibition examines the home in the context of architectural and social history, particularly focussing on twentieth century Australian experience. The intention is to provide researchers with an idea of the resources available in the Monash University Library Rare Books Collection. Books and magazines displayed include plans, construction advice, and interior and exterior designs from past eras, especially from the post war 1950's period. An attractive highlight is provided by original water colour sketches of home improvements and family life of the Bain family, Kew (1952-8).